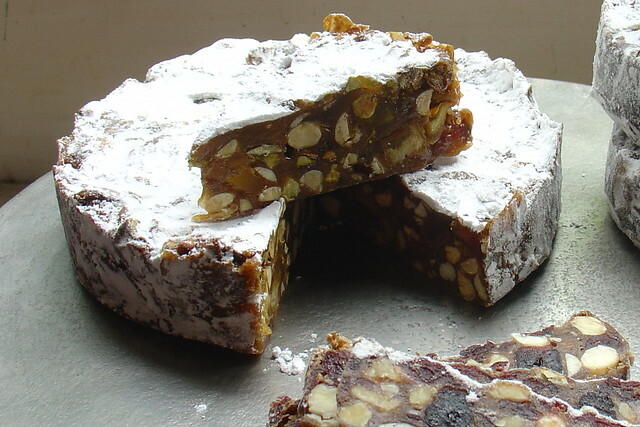 Panforte, an Italian Christmas cake of Siena, Italy, is more confection than cake. 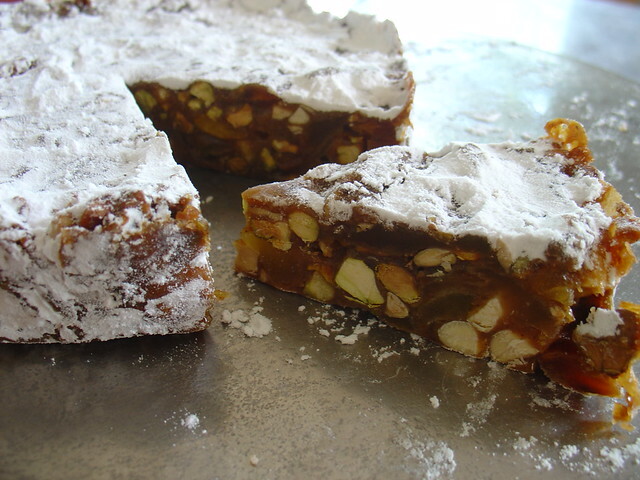 A variety of nuts & fruit are coated in heady spiced flour then enrobed in honey-caramel. The result is a rich chewy treat, delicious when cut into thin slivers and served with coffee. In Italy, each village has their own variation of Panforte, and so I was inspired to make not one but two Gisborne variations. Here is the White Chocolate version. Grease 1 x 18-20cm (or 3 x 10cm) loose bottomed or spring-form cake tin. Make a collar for the sides of the pan, then fit a circle for the base inside the collar. Place nuts into a single layer in a shallow baking tin. Toast, 5-10 minutes, until lightly golden, shaking gently once or twice to toast evenly. Remove from the oven and cool completely. Roughly chop nuts and fruit then combine with zest. Sift flour and spices together then stir in nuts mixture so all ingredients are coated. Combine honey, sugar and syrup in a medium pot. Dissolve sugar over low heat ensuring the mixture is clear of any sugar crystals before bringing to a boil. Boil until soft ball stage (112-116ºC) is reached (about 10-15 seconds). A candy thermometer is handy to test when the caramel is ready. If the caramel is heated too much, the mixture becomes too stiff to mix. Remove caramel from the heat and, working very quickly, stir in chocolate until it melts and the mixture is smooth. Add caramel to the nut mixture and mix until all the nuts & fruit are covered with caramel – this takes a sturdy spoon and muscle power. Scoop the mixture into the prepared cake tin. Press the mixture down using fingers dampened with cold water. Bake 20-25 min (10-15 min in the small tins) or until the mixture is beginning to bubble at the edges. Remove from the oven and cool completely in the cake tins. Peel away baking paper then dredge panforte with sifted icing sugar. Wrap tightly in tinfoil and store in a cool place for up to 3 months. 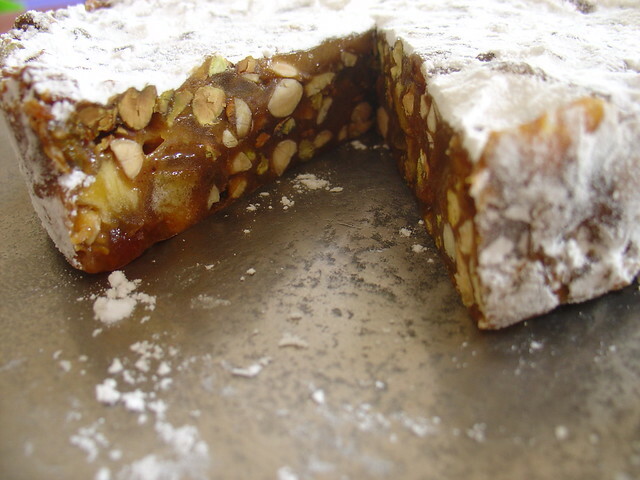 This entry was posted in Baking, Cake, Savour, Summer and tagged Dried Apple Chunks, Panforte, Panforte with White Chocolate, Savour, White Chocolate Panforte by Jo Dohrman. Bookmark the permalink.